“Our season, Celebrating Female Playwrights continues with Sharyn Rothstein’s, regional premiere of By The Water”, states Artistic Director, Ray Croce. “This show is being directed by well-known actor & director Scott Grumling. Scott directed at South Camden Theatre Company in 2016 bringing our audience The Miss Firecracker Contest. Scott came to us with By The Water because of his passion for the play’s story and the playwrights writing style.” “Rothstein wrote these characters as if she knew each one of them personally”, states Scott Grumling. Robert Bingaman, Board President is also excited for this fall show. “To be able to produce such a brilliantly written play with such a powerful cast and crew is very exciting for us here at SCTC,” he said. As hurricane season builds along the east coast, it’s important to be aware of the devastation that can occur along the shore and inland. By The Water brings the reality of two couples fight to stay and rebuild or “take the money” and move away after Hurricane Sandy hit in 2012. According to CNN Money, only 39% of Americans say they would be able to pay for a $1,000 unplanned expense, according to new report from Bankrate. That indication of ongoing financial fragility is especially sobering because emergencies like a hurricane can and do happen. Imagine, for example, that you lived on Staten Island or somewhere “down the shore” during Hurricane Sandy in 2012. Twenty-four residents on Staten Island were killed by the storm, along with unparalleled destruction of dwellings, especially in the coastal communities of what has remained mostly a blue-collar community despite its proximity to Manhattan. 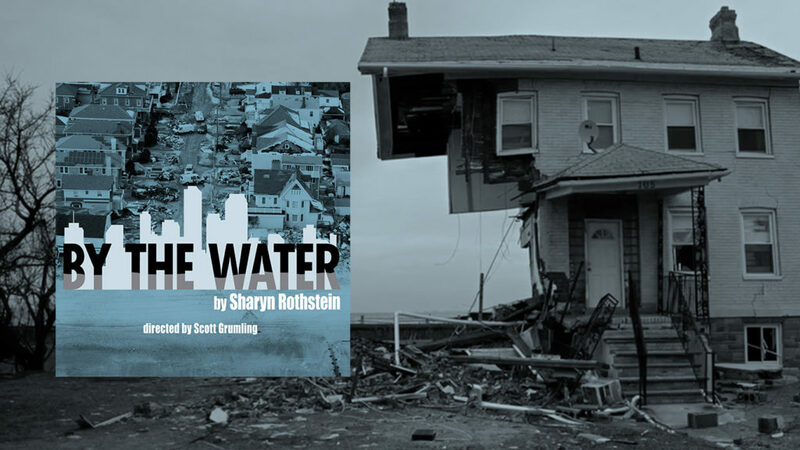 Sharyn Rothstein’s play By the Water, is a piece that premiered at the Manhattan Theatre Club in 2014 after being commissioned by their Writers’ Room. It is about Hurricane Sandy, Staten Island and the shifting sands of life from paycheck to paycheck. By The Water is not a depressing a play. It is a powerful life drama written by a playwright who truly understands her characters. This is the third production of our 13th season which opens September 7 and runs through September 23. Our shows are Friday and Saturday nights at 8pm and Sunday afternoons at 2pm. Tickets are available online www.southcamdentheatre.org over the phone (866) 811-4111 or at the box office one hour before showtime. The South Camden Theatre Company is the professional resident theatre company at the Waterfront South Theatre. Camden’s “Off-Broadway” Theatre was opened in 2010 as the only new free-standing theatre built in Camden in more than 100 years. The intimate theatre space seats 100 and is completely handicap accessible. Sharyn Rothstein is a Brooklyn-based playwright. She is a member of the inaugural class of Manhattan Theatre Club/Ars Nova Writer’s Room, as well as a member of the Primary Stages Dorothy Strelsin New American Writer’s Group. She was also a member of the 2011-2012 Ars Nova Playgroup. She is a member of Ensemble Studio Theatre and holds an MFA in dramatic writing from New York University’s Tisch School of the Arts. She was awarded the Francesca Primus prize for By The Water. Sharyn’s plays have been produced and workshopped in New York and around the country, and her short plays have been published in several anthologies. In addition to playwriting, Sharyn co-created and wrote an hour-long drama pilot for Bravo. She also holds a Masters in Public Health from Hunter College, with a concentration in Urban Health.